Author: Charlotte Gunvor Thorkildsen, MA student, Centre for Medieval and Early Modern Studies, University of Kent, Canterbury. This illustration of a unicorn is taken from a medieval bestiary produced around 1300 and now held in the Cathedral’s Archives (CCA/DCc/LitMS/D/10). The text accompanying the image names this creature a monocerus – the Greek term for the unicorn. Bestiaries (books of beasts) contain illustrated texts depicting the animals of the medieval world; to contemporary readers they carried a spiritual significance. Medieval animals had symbolic meaning drawn from biblical, patristic and classical texts which gave certain beasts the ability to bear witness to God the creator who, as the early Church Father St Augustine of Hippo preached, gave meaning to all things of nature. As such, medieval bestiaries provide each animal with a purpose similar to classical fables (although bestiaries did not give animals the power of speech). Within this Canterbury bestiary the characteristics of each animal are described with a short passage of text, the majority accompanied by detailed pen drawings. Most medieval bestiaries were like the Canterbury example with accompanying illustrations. However, many of the existing fragments are unfinished and a third of the surviving bestiaries do not have illustrations. The Canterbury bestiary is incomplete, both in the sense that it survives as only as a substantial fragment of the complete original and that the original illustrative programme was never completed, with the texts for several animals being left unillustrated beside an empty space on the page. 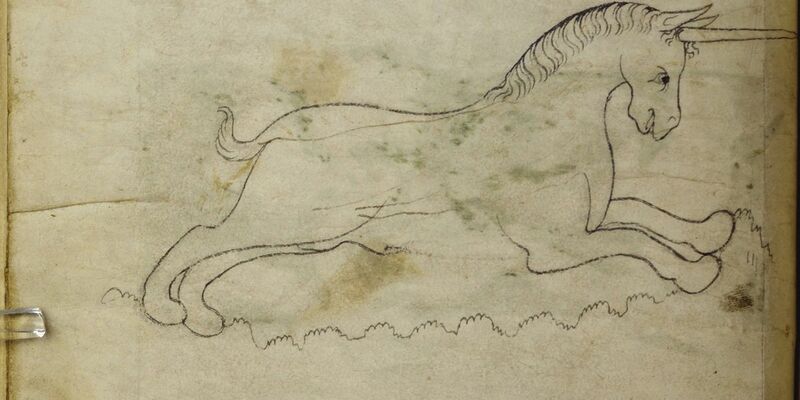 This beautiful pen drawing of the unicorn depicts an elegant creature with the body and head of a horse, a horn protruding from the middle of the forehead, a goat’s tail and then the feet of an elephant. These feet are described in the accompanying text as “elephantis pedibus” – elephant feet. 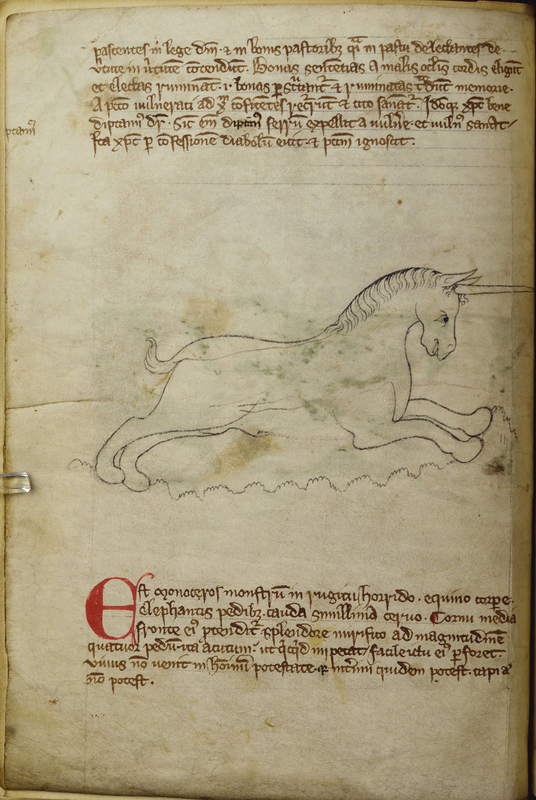 This description of the unicorn follows that of the Roman natural philosopher Pliny the Elder (AD 23–79), who said of the unicorn: “the body resembles a horse, but in the head a stag, in the feet an elephant and in the tail a boar… considered to be the fiercest animal”. This ancient description of the unicorn is accompanied by verses from the Old Testament that refer to a ferocious beast with a powerful horn (Job 39:9). The creature is seen to be leaping in the air, facing to the right with its noble head held high and regal. It is placed above tufts of grass and the artist left the creature uncoloured and unframed. Thanks to their attestations in biblical and classical texts, unicorns in the medieval period were not thought of as mythical creatures, and their reality in medieval minds allowed unicorns to be integrated into various aspects of Christian symbolism. The unicorn was presented as a wild, untameable beast; however, when in the presence of a beautiful virgin the unicorn would approach the maiden and fall asleep in her lap. Many bestiaries illustrate their unicorns as captured, despite their wild and ferocious nature; yet, in the Canterbury medieval bestiary the unicorn is depicted free. This allegory of the unicorn and the virgin remained consistent throughout the medieval period, and became a powerful symbol associated with the Incarnation of Christ, with clear parallels with the Virgin Mary and Jesus Christ. As such it is no surprise that we see so many unicorns depicted in medieval and renaissance religious art. The connection that was made to Christ through the unicorn’s purity and vulnerability resulted in the unicorn becoming a strong symbol of Christian purity, while the creature’s fierceness became an appealing quality for royalty to associate themselves with. Unicorns have also featured prominently in heraldry, with individuals or families wanting to link themselves to this powerful Christological creature. Another factor for their popularity might be the unicorn’s supposed medicinal properties or its chivalric connotations. The royal arms of Scotland have displayed the unicorn since the twelfth century, and when King James VI of Scotland (1566-1625) ascended the English throne in 1603 he chose to keep the unicorn in his royal arms as it had by then become emblematic of the Scottish Crown. The unicorn’s horn was also believed to possess magical and medicinal properties, with the horn being known as an ‘alicorn’. This magical horn was thought to behold general restorative powers and be an antidote to certain poisons. As such alicorns were highly sought after by wealthy collectors and alchemists. By 1600 there were over a dozen famous alicorns held in European churches or monasteries; these were frequently presented on state occasions. An inventory of the Basilica of St Denis in Paris mentions an alicorn over seven-foot-long being kept amongst the religious relics. Alicorns were also described at St Mark’s in Venice and at St Paul’s Cathedral and Westminster Abbey in England. Despite these two English alicorns being lost during Henry VIII’s dissolutions, English royalty maintained its fascination with the unicorn. In 1577 an alicorn was brought to England and kept in the wardrobe of Queen Elizabeth (1533-1603), and the Stuart kings also held alicorns in their individual collections. Clearly then the importance and the wonderment surrounding unicorns persevered well beyond the medieval period and its fabulous bestiaries. Willene B. Clark, A Medieval Book of Beasts: The Second-Family Bestiary (Woodbridge, The Boydell Press, 2006). Odell Shepherd, The Lore of the Unicorn (Great Britain, Unwin Brothers, 1930).